Feasting due to festivities often comes with an unwanted increase.. To counter the gain and guilt, I embarked on a diet on 2nd day of new year! Today I missed my breakfast. 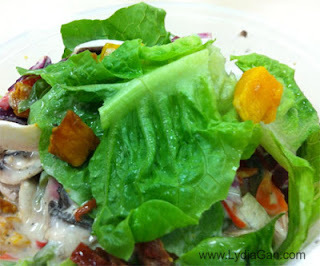 Instead of the usual Beef Hor Fun or Wanton Mee, I decided to settle for a bowl of salad for lunch. I've resigned to atone for my "sins" by munching plain veg like a cow for the next few weeks. But thank God, I chance upon this colorful salad stall at Amoy Street Food Market. Discovered that eating salad can be fun and economical too! + Carrot Orange with home-made Ceasar dressing. At $4.50, the salad comes with basic greens like lettuce, and 5 choices of toppings. Additional topping costs $0.50. 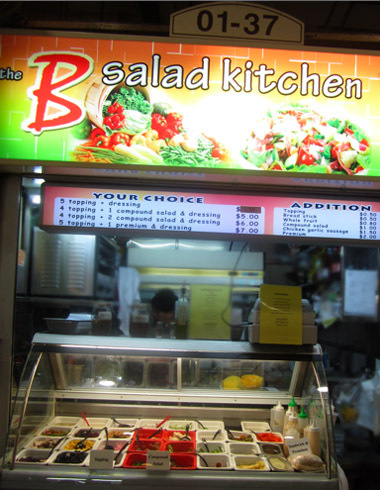 Additional compound salad topping like poached chicken or smoked duck cost $1. Amazing price! Where else can we get smoked duck at $1? 10 exciting types of homemade dressing like Ceasar, Honey Mustard, Japanese Wafu, Thai Lemongrass, Teriyaki Mayo, Virgin Olive Oil & Balsamic to Red Wine Vinaigrette are available. 1. Sun dried tomatoes (Toppings) – Rare find. Gives depth to your salad. 2. Roasted Pumpkin (Toppings) – Naturally sweet. Well-roasted, fragrant and soft. 3. Sweet Potato (Toppings) - Goodness of purple potato. Tender to bite. 4. Pickled Onion (Toppings) - Crunchy onion with zest. Makes your greens more appetizing! 5. Orange Carrot (Toppings) - Carrot soaked in orange love. 5. Sandwich - Price range from $5 - $7, with choice of 3 toppings. Black Olive bread or Ciabatta bread. 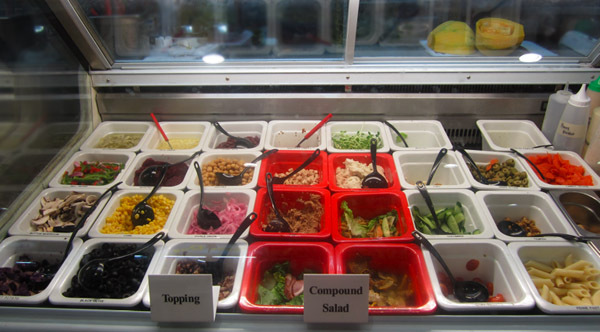 About 30 types of toppings to chose from! Fresh greens with interesting variety of toppings. We shall never be bored to diet daily as the toppings are changed regularly. The stallholders are pleasant, humble and helpful people. 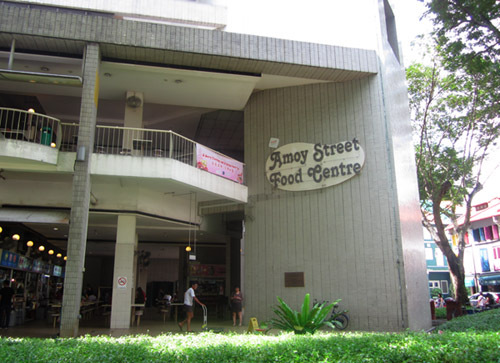 As it is a hawker centre, we might have to raise our voice to inform the vendor on the toppings you have chosen, especially during busy lunch hours. Public parking lots along Amoy street and Telok Ayer street.